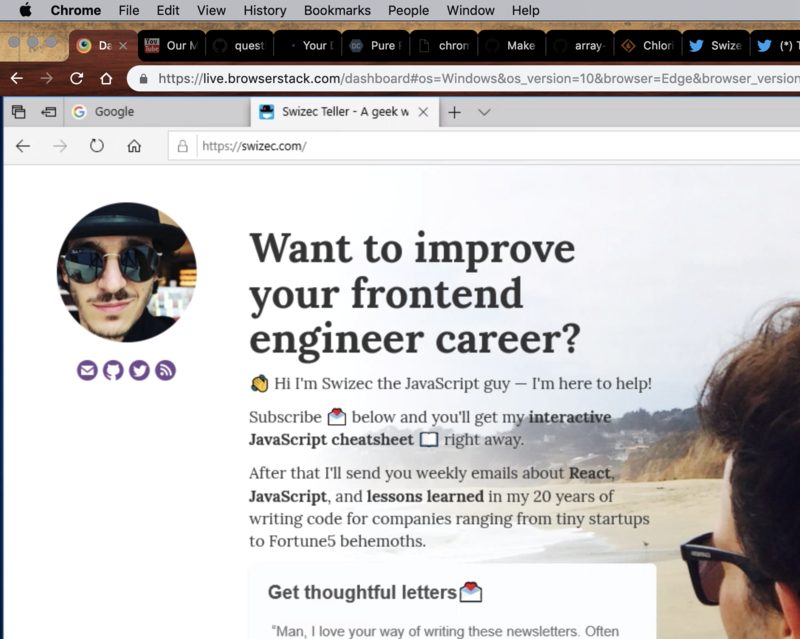 Swizec Teller published on March 20, 2019 in Front End, Technical. 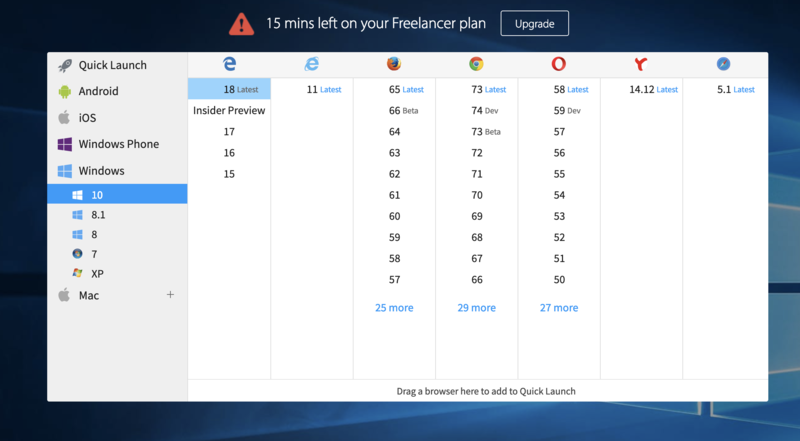 When was the last time you had to make sure your app works on weird browsers like Microsoft Edge? Me, I had to do it earlier this week. My experience building websites for a web agency back in high school meant I knew what I was getting into. Client: Hey can you make it work on Edge? Microsoft Edge did not disappoint. Array.flat() doesn’t work on Edge. On every other browser it flattens nested arrays. On Edge it blows up and says the method doesn’t exist. Okay not every browser. Only the ones that people use. You can solve that with a polyfill right? An npm package that loads itself up and makes Array.flat work. In this project I was also using chroma-js to manipulate colors. Convenient way to take a color and give it a little alpha channel with chroma(color).alpha(0.5). Except on Edge this created invalid hex values. Colors no work at all. You thought that was bad? It gets even better! Oh also on Edge node.getBoundingClientRect() doesn't return a DOMRect. Oh no, it returns a ClientRect. .getBoundingClientRect() doesn’t work on Edge. Well it does but it returns a ClientRect instead of a DOMRect. They work the same except when they don’t. For example DOMRect has x and y coordinates. ClientRect only has top and left. Oh and ClientRect only exists on Edge. Of course. This meant I had to fix my useDimensions library. Project relies on it a lot to measure stuff and build responsive data visualizations. Oh and flexbox doesn’t work correctly. Instead of spacing evenly it bunches everything on the left. Of course. Despite all this pain, there is a silver lining 👉 BrowserStack made testing on Microsoft Edge absolutely painless. Well the testing itself was painful and the results made me cry but I could test. I’m a Mac kind of guy you see. I don’t have Edge. I don’t have a Windows machine. I have zero interest in VirtualBox and futzing around with images and installing Windows on a partition and whatever else it used to take to test on weird browsers. With BrowserStack I was able to run Edge in a Chrome tab. That’s right. A Chrome tab emulated an entire operating system running a full screen browser. 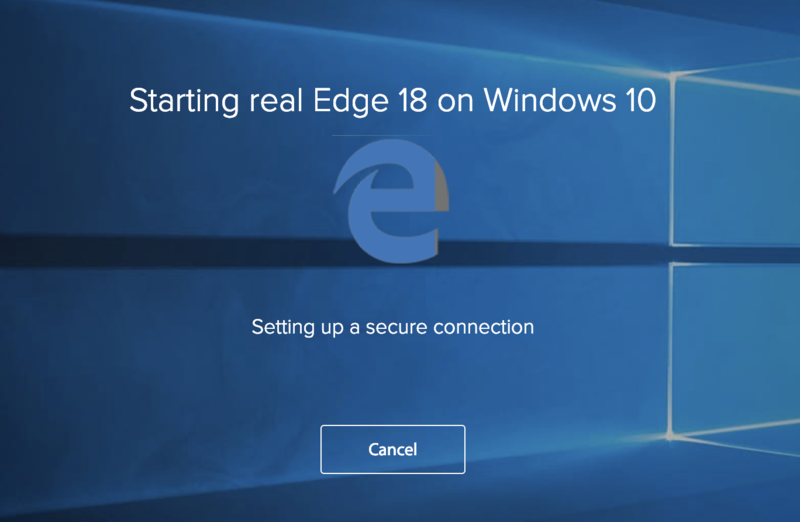 Edge probably runs on their servers and streams an image to the tab. Still, feels like magic. You can use it for free for 15 minutes I think. I needed more so I ponied up a whopping $19 for a freelancer plan. That gave me 100 minutes. You can even run things from localhost. No idea how they made that work. Type http://localhost:3000 into the URL bar and it actually goes to your localhost. And here’s proof. Edge running inside Chrome showing my homepage.